A brief rekindling under Louis van Gaal aside, it has been a testing few years for Bayern fans, often playing second fiddle to a couple of clubs. Battling their way through to the Champions League final at their own stadium, things seemed to be boding well for Bayern: as well as the benefit of playing at the Olympiastadion in front of their home supporters, their opponents Chelsea had been left severely weakened by a string of suspensions. Bayern controlled the game, taking 35 shots to Chelsea’s 9 and the majority of possession, but struggled to score. Eventually Thomas Muller broke the deadlock only for Didier Drogba to equalise minutes later – Arjen Robben messed up a penalty, allowing Chelsea to hold on and sneak the win on penalties. With everything seemingly pointing towards a Bayern win, they could be forgiven for wondering whether Bayern-Dusel – the myth of luck that has pervaded Bayern’s history, resulting in many a late win – had deserted them. However, the most obvious reason for this is perhaps a bit more distressing: an example of making your own luck, they simply aren’t as good as the great sides of their past that earned them their lucky reputation. This perhaps says more about those previous sides though – if a Champions League finalist could be really disappoining for Bayern fans, those that did get the rub of Bayern-Dusel must have been really great. The side to earn them the lucky reputation were the team of the early seventies. Taking over Bayern in 1970, Udo Lattek arrived in Munich just as their youth side were providing some rather special first teamers. 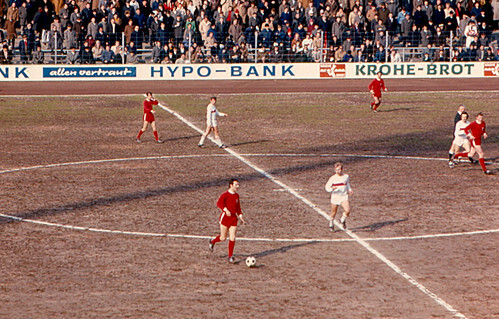 Given they provided much of the team, it may not come as a shock that Bayern played in a similar way to the 1972 European Championship-winning West German side – taking their own path from the play of 1950s Hungary, Bayern used the same passing game and interchanging of positions that made the Dutch Total Football sides of the same era so successful, but looked to sit back when defending rather than pressing intensely like the Dutch did. Set up in a 1-3-3-3, each player had a noted position but they could potentially pop up anywhere on the pitch as Bayern looked to probe the opposition and manipulate space to get their goals. Arguably the greatest German goalkeeper of all time, Sepp Maier’s place since his emergence from the youth team in 1962 was undisputed. Ahead of him was sweeper Franz Beckenbauer, who is regularly named as Germany’s greatest ever player. Having started out as a midfielder, Beckenbauer dropped back into defence to provide elegant attacking play from deep, as well as intelligent defending. For Beckenbauer to be able to stride out of defence, he needed dependable defensive cover, which was provided by the physical Hans-Georg Schwarzenbeck, with who he developed a great understanding. As he said himself, â€œFranz reminds me of my old teacher in the printing office. He handled printing ink all day long but still his hands always were clean. I, however, only had to look at the printing machine and I already would get dirty!â€ Nevertheless, his defending may not have been as pretty as Beckenbauer’s, but it was pretty much just as effective. To their left was one of the finest attacking full-backs the game has seen in Paul Breitner. He was one of the first to leave the side, moving to Real Madrid in 1974 before returning four years later when Bayern’s success began to dwindle, but he was by far the best to have made the left-back position his own, despite the performances of Bernd Durnberger and Udo Horsmann. At right-back was the dependable Dane Johnny Hansen – one of few foreigners in the sideÂ after proving himself at relegated Nuremberg. In midfield Franz “The Bull” Roth provided defensive steel with physical play as well as a stinging shot, accompanied by the agile Rainer Zobel. The versatile Uli Hoeness was one of the stars of the team – knitting play together, finding space and finishing moves with aplomb. Record signing Jupp Kapellmann provided quick dribbling and strength despite his small size, while Swede Conny Torstensson linked play with neat passes – all looking to set up uber-poacher Gerd Muller for one of his hundreds of goals. Later on a young Karl-Heinz Rummenigge would emerge, slotting perfectly into Bayern’s set-up. In Lattek’s first season they won the DFB-Pokal, then proceeded to win the next three Bundesliga titles, competing with the Gunter Netzer-inspired Borussia Monchengladbach. In the year of their final Bundesliga title of this era (1974), they completed a double, also winning their first European Cup. Lattek left for rivals Monchengladbach the following season but replacement Dettmar Cramer led them to two more European Cups. With many of the greatest players in history, an attractive and fresh style of play and a wealth of trophies, this Bayern Munich were a bit more than lucky. Hodgson’s England: what can we expect?